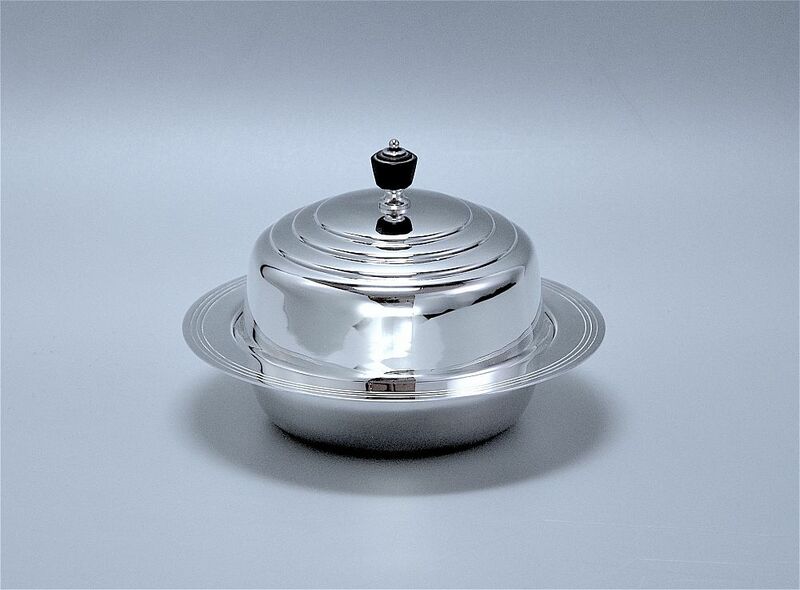 This very elegant Art Deco silver plated muffin dish was designed by Keith Murray for Mappin & Webb in the 1930/40s. The lid is tiered with a black bakelite finial and the rim of the dish shaped base has the incised circles so typical of Murray's designs. The base has an removable internal plate. Hot water would have been poured into the base, the plate placed over it, the food placed on the plate and the lid placed over the food to keep in the warmth generated by the hot water beneath the plate. The base is signed "Triple Deposit Mappin & Webb Prince's Plate London & Sheffield" and has a stylised triskelion. There is a date letter "M" within a shield shaped cartouche which may be for 1941. The foot is also stamped "W27699" and "R195 Rd 772183". The initials "GJ" have been engraved on the base. Style, practicality and usefulness all in one lovely object. Use it for butter, muffins, crumpets cheese or how about caviar? !